On Monday, Apple CEO Steve Jobs introduced the new iPhone 4, which brings many new features, in both hardware and software. Let's take a look at what's new with the iPhone 4, the improvements in iOS 4, and get you the details on how and when you can get your hands on the new device. The iPhone 4 introduces a brand new design, featuring both a glass front and back. Apple claims this glass is several times more resistant than plastic. 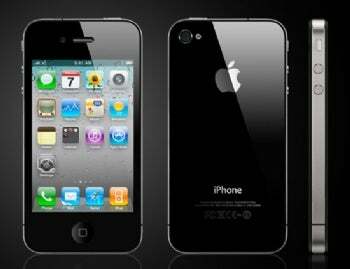 The iPhone 4 glass panels are held in place by a stainless steel band, which also functions as antennas for the phone's wireless chips. The volume buttons on the right are now separated, and above them you will find the silent mode switch. The body of the iPhone 4 is also significantly thinner, at 0.37 inches thick, and weighs slightly more (two grams). Next to the headphone jack at the top, there is a tiny hole that is actually a secondary microphone, which is used for noise suppression (the Google Nexus One has a similar feature). On the back of the phone, you get a better camera installed (5MP versus 3.2MP on the iPhone 3GS) and a LED flash. The iPhone 4 camera can shoot 720p HD video, which you can then edit using the iMovie iPhone app (a separate $4.99 purchase from the App Store). On the front of the iPhone 4, there are two new striking features. First off, there is a secondary video call camera that you will be able to use with Apple's FaceTime, a video calling service that will work initially only between iPhone 4 devices, and only via Wi-Fi (nope, no 3G video calls on the iPhone 4 yet). The iPhone 4 features an improved display, which Apple calls a Retina Display. It features a higher resolution and pixel density than previous models, but is the same size (3.5-inch) as the iPhone 3GS and 3G. On the inside, the iPhone 4 now runs on the Apple-designed A4 chip (found also on the iPad); Apple says this chip offers power management features that, combined with a bigger battery, can deliver up to 7 hours of phone calls on 3G networks, or up to ten hours of video playback. Apple also added a gyroscope inside the iPhone 4, which will come in handy for cool new games when paired with the accelerometer. Finally, the iPhone 4 will also ditch traditional SIM cards, and will use microSIM cards, like the ones used on the iPad WiFi + 3G model. The iOS 4 (previously known as iPhone OS 4) will debut on the iPhone 4 and brings several new features on the platform, some of which were available on other phones for some time now. First off, Apple says it has finally gotten multitasking right, so you will be able to run third-party apps in the background and switch between them at any time by tapping the home button. This way you will finally be able to listen to Pandora in the background, while checking your e-mail or browsing the Web (but keep an eye on those new AT&T data caps, detailed later). The Mail app will receive some much-needed improvements, such as a unified inbox for all your e-mail accounts. You'll also finally be able to have multiple Microsoft Exchange accounts with the iOS 4. Other changes you will notice in iOS 4 are home screen wallpapers, (smart) folders for apps, and Web and Wikipedia search from the home screen. The text-messaging app will also show you how many characters in a text you used, so you can better manage your text allowance. 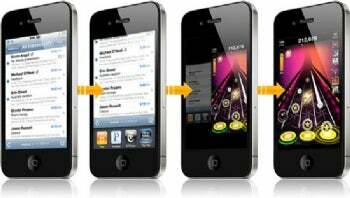 You will be able to download two new apps on the iPhone 4 or iOS 4 devices. The first one is iBooks (first seen on the iPad), which will also let you add PDF files to your library. The best bit about the new iBooks though is the fact it will sync wirelessly for free your bookmarks, library, and notes with your iPad (or any other devices Apple might introduce the app for in the future - Kindle beware). The second big app you will be able to download is iMovie ($4.99), which frankly looks to be the most powerful mobile video editing app seen so far. iOS 4 will be available to download for free to iPhone 3GS, 3G, and iPod touch owners on June 21. First generation iPhone and iPod touch owners are left out of the iOS4 party because of hardware differences; the iPhone 3G will not get the multitasking feature for the same reason. The iPhone 4 will be out on June 24 and pre-orders start on June 15. Rumors of an iPhone on Verzion proved to be only wishful thinking so far, so you are stuck with AT&T if you want one. Pricing starts at $199 for the 16GB model and $299 for the 32GB model. You are eligible for these rates even if you are an AT&T customer already, as long as your contract expires in the second half of this year, and you top up your contract with another two-year commitment. As a new AT&T customer, with the iPhone 4 you will have to choose between a $15 per month data plan (DataPlus, includes 200MB of downloads), or a $25 per month plan (Data Pro, includes 2GB of downloads). You will also have to pay $20 per month for tethering privileges (no additional data included in the price). If you choose the DataPlus plan, make sure you keep an eye on your downloads, as multitasking with Pandora in the background or streaming Netflix movies can quickly bring you over board. Follow @PC World and @Daniel Ionescu on Twitter.